On January 20-21, we’ll have the first full moon of 2019, and the first lunar eclipse of 2019 (and this is an eclipse-heavy year, with three solar and two lunar eclipses). It can be viewed from North and South America, Greenland, Iceland, Europe, northern and western Africa, plus the Arctic region of the globe. 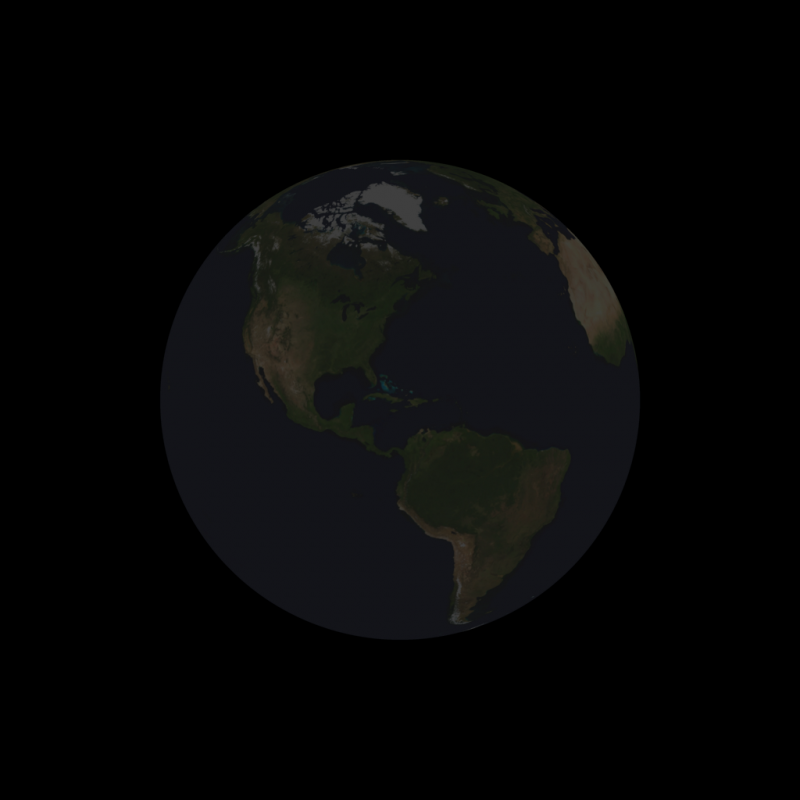 More details – and eclipse times for North America, plus links for those elsewhere – below. The eclipse will happen on the night of the year’s first of three straight full supermoons, meaning the moon will be nearly at its closest to Earth for this January, as the eclipse takes place. Many are calling it a Blood Moon eclipse. Why? We’re not entirely sure, but you can read more about Blood Moons here. Now here’s a single, sad last thing. This will be the last total lunar eclipse to grace Earth’s sky until May 26, 2021. View larger. 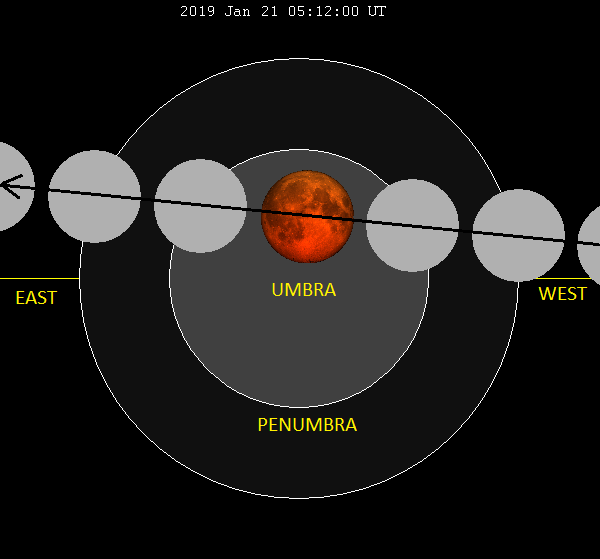 | At greatest eclipse, the totally eclipsed moon will be straight overhead (at zenith) over western Cuba, where it’s just after midnight local time on January 21, 2019 (05:12 UTC on January 21). Those to the west (left) of this spot (most of North America, Hawaii) will see the moon at greatest eclipse on the evening of January 20. Those to the east (right) of this spot (Europe and Africa) will see the moon at its greatest eclipse in their western sky on the morning of January 21. Clouded out? Wrong side of Earth to view the moon in eclipse? Watch online via the Virtual Telescope Project. 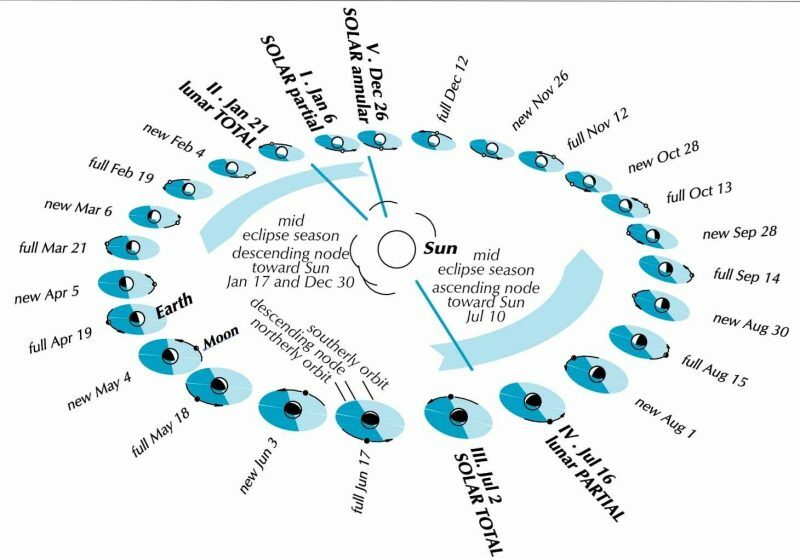 The January 20-21 total eclipse of the moon lasts for somewhat more than one hour. It’s preceded and followed by a partial umbral eclipse, each time persisting for over an hour. The whole umbral eclipse from start to finish has a duration of nearly 3 1/3 hours. Additionally, a penumbral lunar eclipse takes place before and after the umbral lunar eclipse. However, a penumbral lunar eclipse is so faint that many people won’t even notice it while it is happening. In our post, we only give the times of the moon passing through the Earth’s umbra – dark, cone-shaped shadow. See the diagram below. 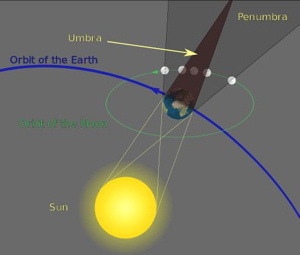 In any umbral lunar eclipse, the moon always passes through Earth’s very light penumbral shadow before and after its journey through the dark umbra. At the eastern/western fringes of the viewing area, you can only see the beginning or ending stages of this eclipse. For instance, from the Middle East and eastern/southern Africa, you might glimpse the beginning of the partial eclipse low in the western sky shortly before the sun rises and the moon sets on January 21. 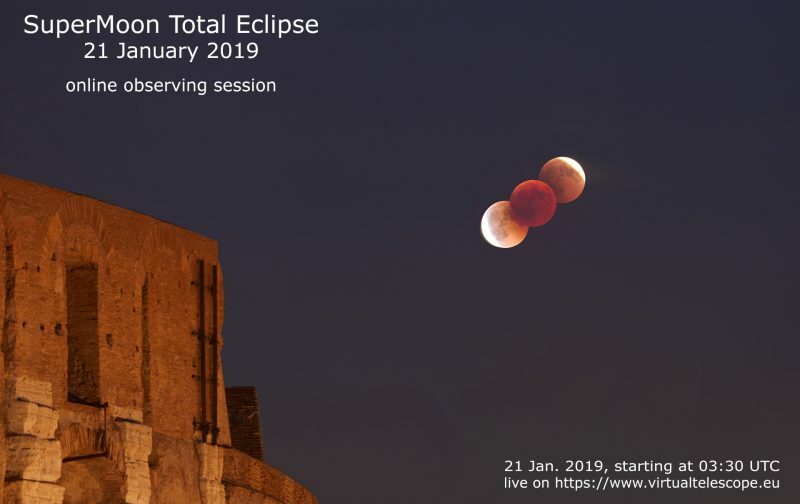 At the other extreme – from the temperate regions of northeastern Siberia – you may catch the final stages of the partial eclipse low in the eastern sky for a short while after the sun sets and the moon rises on January 21. The moon will pass through the northern half of the Earth’s shadow, as depicted on the diagram below, to present a total eclipse for a period of 62 minutes. However, when the moon travels more deeply into the Earth’s shadow, it results in an even longer total lunar eclipse. For instance, exactly six lunar months (six full moons) ago – on July 27, 2018 – the full moon passed almost exactly dead center through the Earth’s shadow, to stage a total eclipse lasting one hour and 43 minutes. That July 27, 2018, production gave us the longest total lunar eclipse of the 21st century (2001 to 2100). The moon travels from west to east across the Earth’s shadow. On the night of January 20-21, 2019, the moon’s south pole swings most closely to the center of the umbra, so we expect the southern half of the moon to appear darker than the northern half during the total eclipse. The lunar disk often exhibits a coppery color during a total lunar eclipse. Although the moon is completely immersed in the Earth’s dark shadow, the Earth’s atmosphere refracts (or bends) sunlight and the longer wavelengths of light (red and orange) pass onward to fall on the moon’s face. The dispersed light from all of the world’s sunrises and sunsets softly illuminates the totally eclipsed moon. Actually, if you were on the moon, looking back on Earth, you’d see a total eclipse of the sun. If you were on the moon at greatest eclipse (Januray 21, 2019, at 05:12 Universal Time), you’d actually see a total eclipse of the sun. Image via the U.S. Naval Observatory. 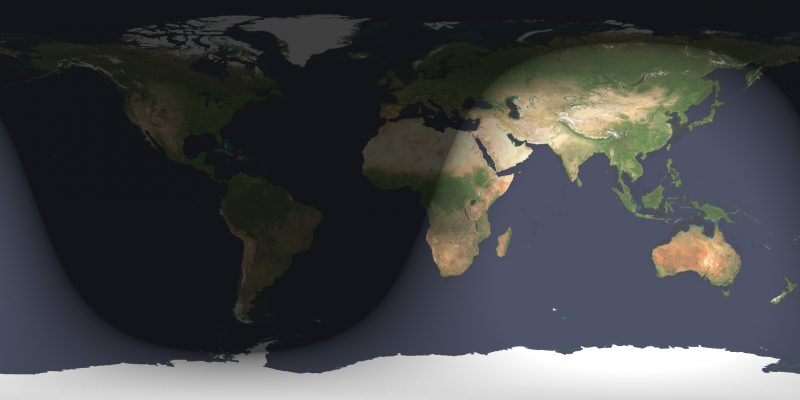 Day and night sides of Earth at greatest eclipse (January 21 at 05:12 Universal Time). The shadow line at left represents sunset January 20 and the shadow line at right depicts sunrise January 21, 2019. Image via the U.S. Naval Observatory. Only at full moon is a lunar eclipse possible. That’s because it’s the only time that the moon can be directly opposite the sun in Earth’s sky and swing through the Earth’s shadow. Yet, a lunar eclipse doesn’t happen at every full moon because the full moon, depending upon the month, can swing anywhere from five degrees (10 moon-diameters) north or south of the Earth’s shadow. 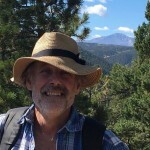 The next five full moons in February, March, April, May and June 2019 will veer to the north of the Earth’s shadow until the moon partially clips the Earth’s shadow on July 16. 2019. After that, the following five full moons in August, September, October, November and December 2019 will swerve to the south of the Earth’s shadow, until the penumbral lunar eclipse of January 10, 2020. 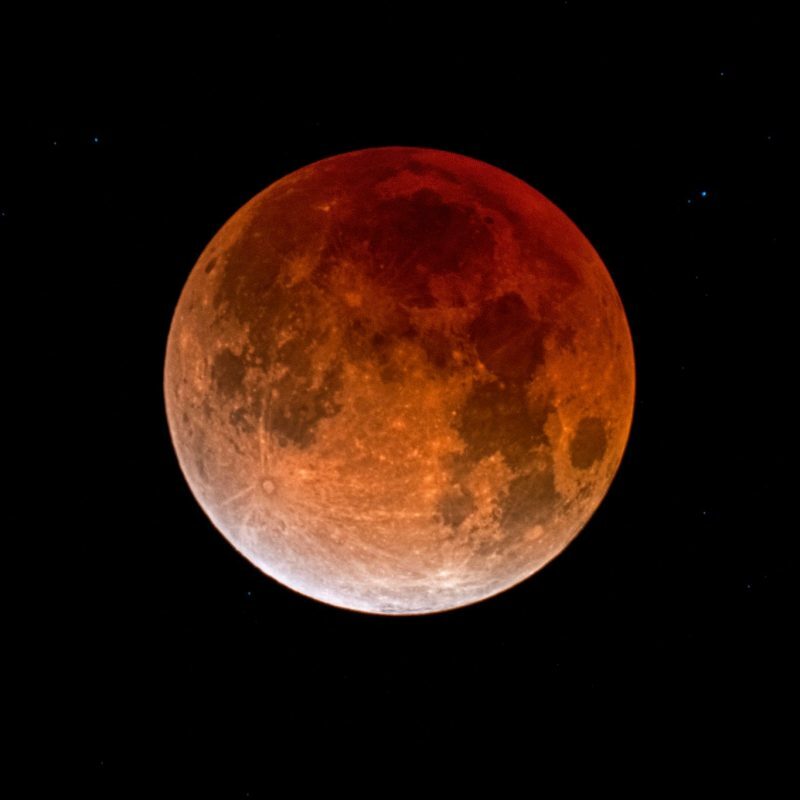 There will be a total of four lunar eclipses in the year 2020 (January 10, June 5, July 5 and November 30, 2020), but all these lunar eclipses will be hard-to-see penumbral eclipses. If you’re in a position to witness tonight’s total eclipse of the moon, by all means do so. The next total lunar eclipse won’t happen until May 26, 2021. 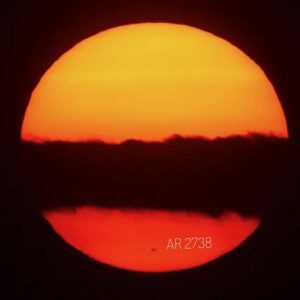 A heliocentric or sun-centered view of eclipses in 2019. Earth-moon orbit shown at new and full moon dates. Sizes of Earth, moon, sun very exaggerated. The plane of the moon’s orbit is blue. There’s an eclipse if the moon is full or new when it is in or near the ecliptic or sun-Earth plane. This year there are 5 eclipses, instead of the most usual 4, because a 3rd eclipse season begins before the end of the year. Illustration via Guy Ottewell. Bottom line: The January 20-21, 2019, total eclipse of the moon can be viewed from North and South America, Greenland, Iceland, Europe, northern and western Africa plus the Arctic region of the globe. Enjoy it!